Have you ever heard anyone say that wherever you are, there will be a rat only a few metres away? That can’t be true, surely? Suppose you’re standing in the middle of a football stadium, you’d see a rat if it sneaked up on you. Or suppose you’re swimming in the middle of a large swimming pool? You’d notice a rat glide past doing backstroke, wouldn’t you? But if that’s not true about rats, I do know something that may be a few metres from you right now – although you probably won’t be able to see it – a Pokemon monster. Don’t believe me? 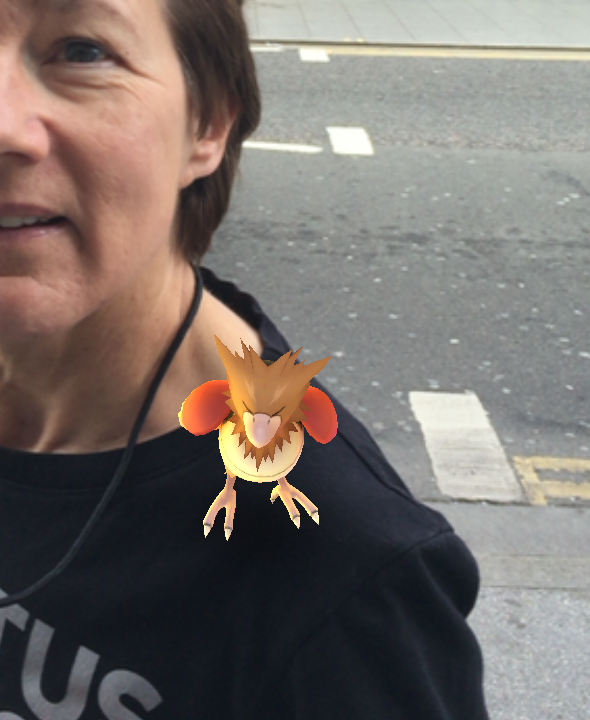 Well, neither did the Old Girl when she went out for a walk but just look what’s on her shoulder! So, it occurred to me that if there are so many Pokemon monsters about and people keep hunting them down, they might need a few more. I’m versatile and adaptable, I think I could do the job. It can’t be hard work, either. Just waiting around to be found doesn’t sound like it’s very taxing. But I’m not sure where to apply for the post of a Pokemon monster. If you know, perhaps you’d get in touch or even better, if you can put in a good word for me, that would be great. In the meantime, if you’re not out on the prowl for Pokemon monsters in your local area or if you’re waiting at a Pokestop for the next available monster, why not read a book to pass the time? The Old Girl’s book THE GREAT WAR – 100 STORIES OF 100 WORDS HONOURING THOSE WHO LIVED AND DIED 100 YEARS AGO, might be just the thing. There are 100 short stories so if a Pokemon monster comes your way, you won’t have to wait long until you’ve finished the story and can go get your monster. You can get the book here on Amazon as a paperback and as an ebook. Happy hunting!